During our Japan holiday back in 2008 we spent a couple of days in Kyoto, the historical and cultural capital of Japan and home to Nintendo HQ! Kyoto is one of the few Japanese cities to avoid the destruction of aerial raids during World War 2. Compared to Tokyo the city has an older, almost sedate feel. We stayed for two nights at a ryokan, a traditional Japanese style inn. We enjoyed our stay and glad we experienced a ryokan, but found it a bit pricey and the 10pm curfew was a little restrictive. This temple features a “nightingale floor”, a special timber technique which makes it impossible to walk on without it making squeaking sounds. As you walk on the floor boards they chirp like a bird, acting as an alarm system. Pretty cool! I felt like a stealth ninja trying to walk along the floors without making a sound. Of course I failed miserably! A beautiful Zen Buddhist temple set in a stunning Japanese strolling garden. The largest wooden structure in the world. The massive building houses one of Japan’s largest bronze statues of Buddha (Daibutsu). We took a trip to Nara Park, a public park located in the city of Nara. The park has over 1000 sika deer freely roaming around the park which feels pretty surreal. You can buy biscuits and feed the deer from your hand, the wife kept her cool but I was just a little nervous around them! Of course no trip to a city in Japan would be complete without checking out the arcades! Here are some pictures taken at a-cho Arcade, which can be found in the main shopping mall, easily identified by the large teddy bear that points upstairs. After a full day sightseeing and a bite to eat, it was cool looking round the shopping mall and playing some games here. Today some more new spares arrived for my Sega Naomi cabinet. There were a lot of Naomi cabinets on UK shores, and I thought a big plus of having a Naomi cabinet would be the availability of new spare parts to make the cab mint. Completely wrong! Sadly most items are now NLA. I wanted to replace the legs with Sega Japan official Naomi SD cabinet legs, and I was lucky to get the SD leg kit when I did last year. I’m still on the lookout for a new monitor surround, but I suspect finding one is going to be pretty impossible now. A massive thank you to Craig / Giz10p for these parts. Here is my Capcom Mini Cute – Pink Edition. Luckily the Mrs took a shine to this cabinet and didn’t need too much convincing! The cabinet is in excellent condition, and looks great next to the Neo SC-19. I haven’t had to do anything bar a light clean inside. The pink exterior has been re-sprayed and I must say a superb job was made. The monitor is amazing – sharp, bright, clear and burn free. The previous owner mentioned that there was a fault with the H-size pot but I haven’t looked into this yet. This cabinet originally came in three flavours – Pink, yellow and turquoise. The cabinet is very well built and has a surprising amount of room inside for such a small cab. 1. Ball tops and buttons renewed. 2. Repro marquee holder fitted. 4. CP overlay renewed (MCS Arcade repro). 6. Side art in poor condition, art replaced (MCS Arcade repro). 7. White exterior cleaned. Small scuff on side touched up. 1. Check monitor H-size pot. Repair / replace pot if faulty. 2. Replace sticks (LS-32’s) – shafts are worn. 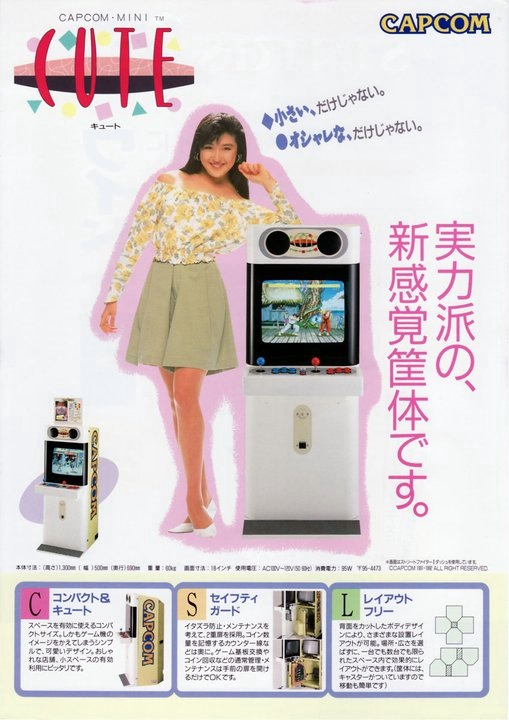 Unlike the Neo SC-19, the monitor can be rotated. I love Cave games and have always been curious about Pink Sweets so this seemed like a perfect match! Many thanks once again to tart31 / Martyn for this awesome cab!